This closure device saves both time and money when you winterize your pool. Simply replace your skimmer plate with the Aquador face plate and snap on the freeze-proof plastic closure. Your skimmer is now protected from freeze damage. Aquador eliminates the need for costly drain downs in the fall. Our three models fit most above-ground skimmers. 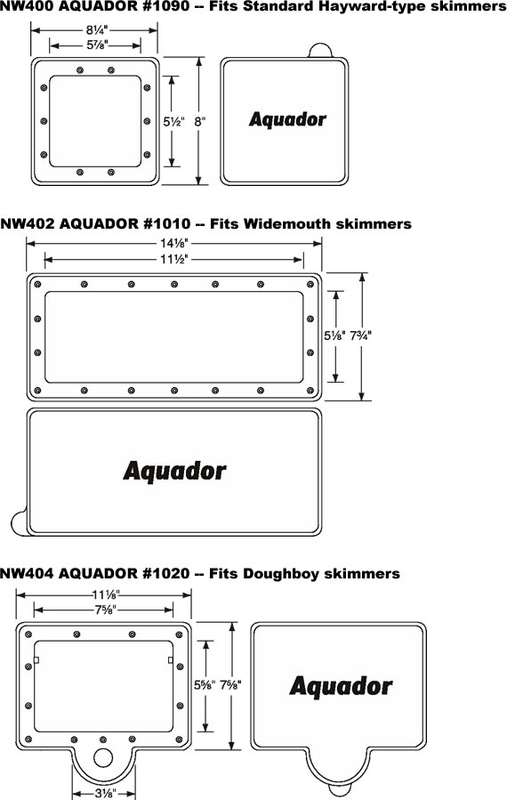 The Aquador #1010 will fit the Waterway Flo Pro II wide mouth skimmer. I am having trouble getting the aquador widemouth skimmer cover off. Is there a method to do this. A Answered on 5/16/2017 by InyoPools Product Specialist Lennox H.
Hi, Karen. This cover snaps on/off like a topaware lid. Will the NW402 fit the Hayward SP1091WM skimmer? Yes, the NW402 will fit the Hayward SP1091WM skimmer.